how kate and kayla fell in love with jamaica …. So here’s the story of two girls who took a vacation that changed their lives forever in the longest blog post ever ….be patient, it’s worth it, we swear! It all started last January when I (Kayla) decided that I hated the freezing cold Canadian winter and wanted a break from real life (at the time I was teaching piano to little kids which I loved to do but just wasn’t ready to do for the rest of my life yet … struggling with a mortgage and other day to day annoyances), so I asked my friend Kate if she wanted to go on vacation to a sunny destination with me. Obviously, she said “YES!”. I’d always wanted to go to Jamaica and Kate had never been either so it seemed like the right choice (little did we know how right it would be …). We looked up some all-inclusive places on the internet with the intention that we were going to relax and lay on the beach all week. We chose the one we wanted and went to talk to a travel agent about booking it. This is where we would like to publicly thank our agent, Nathalie, for telling us the beach was terrible at that resort and helped us decide on Breezes in Runaway Bay … I’m just not sure if we would have had the same experience and fallen in love with Jamaica like we did had we stayed at that other resort. (This question will go unanswered forever!) (For those of you who are interested, Runaway Bay is located on the north coast of Jamaica, about an hour from Montego Bay, and twenty minutes from Ocho Rios). Once our trip was booked, we started working out like crazy to look good in our bikinis and started the countdown to March 14th……. Let me tell you how excited we were booking that trip… we booked it in secret (I apologize to every one of our friends and family that we did not tell them about it before…because we had actually been planning it for weeks…) mostly because we didn’t want to have too many people to have to worry about time off from work/where they wanted to go/experience/do whilst on vacation. There’s something about having a secret like that that makes it all the more exciting. We had the time off and that’s all that mattered! Also, had Kayla not had this idea (yes, it’s Kate now..we will be going back and forth with this post!) I have NO idea where I would be. I was stuck in a job that yes, I loved doing (I’m a hairdresser)..but hated going to (to everyone who has a demanding boss, you understand). I felt trapped where I was and felt like I had no escape! Well…this trip was the escape I needed, and maybe was what gave me the balls to finally step up and change my life. (THANKS KAYLA!) Now (to my beloved clients), I didn’t always feel this way about my job, but sometimes you just know it’s time to move on…who knew I would move on….to an island! (lol) Let’s just say that Kayla and I were just lucky that we were both having our quarter-life crises (I pray not MID-life…) at the exact same time…. 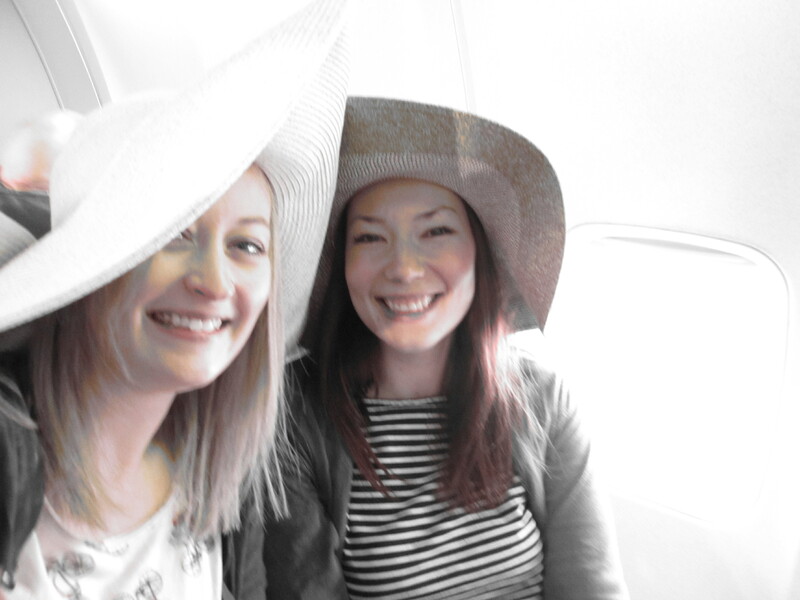 So there we were, all packed for Jamaica, at the airport with our huge sunhats (like seriously, huge) and gigantic smiles on our faces. I think the plane ride from Ottawa to Jamaica was the longest four and a half hours of my life (damn those little maps on the WestJet tv screens that make everything seem so close haha). But, we finally arrived in Montego Bay and couldn’t have been more excited!! I consider our first true Jamaican experience as the walk Kate and I took from the airport lounge to the bus. Stepping outside from the air conditioned airport into the Jamaican air is almost an inexplicable feeling that I’ve had every time I walk out of Sangster International. I don’t know what it is …. the hot and humid air, the gentle breeze, the sunshine, the birds, the smell of amazing Jamaican food cooking, the fact that I can buy a red stripe the second I exit the airport, or maybe just all of the above – but its a feeling I would love to have every moment of my life! Oh, and did I mention all the gorgeous Jamaican men telling me how beautiful I am (like even the customs officers(!?) … cause to be honest, it still hasn’t gotten old for me and I don’t think it ever will … In Canada if I walk down the street, a stranger will barely make eye contact and smile, nevermind tell me if he thinks I look good! Ladies – Jamaica is seriously the ultimate ego boost you will ever have! Oh and the ride to the resort! People told Kayla and I to try to book a resort close to the airport so you don’t have a long bus ride…but I can‘t imagine not having the chance to even see any of the country at all! That first view of the beach after having spent months shoveling snow in the cold seriously takes your breath away! I loved seeing all the people and animals as we passed just chillin‘ on the side of the road at a bar or at a jerk center (while I’m thinking…hmmm so that’s where they come from..haha) all while drinking probably the best tasting Redstripe I have ever consumed in my life. (YES! drinking while driving! Well…we weren’t driving…yet…but more on THAT later) But I will not bore you with the gorgeous details of that bus ride or the check in etc at the hotel….I will just say this..as soon as we got there…we knew we were different. We knew that we were not just going to “lay on the beach”. And I knew, that even though I promised clients (seriously..people MADE me promise) not to leave the resort, cause, you know, Jamaica is sooo dangerous…I was going to..and we did..within hours of checking in…. 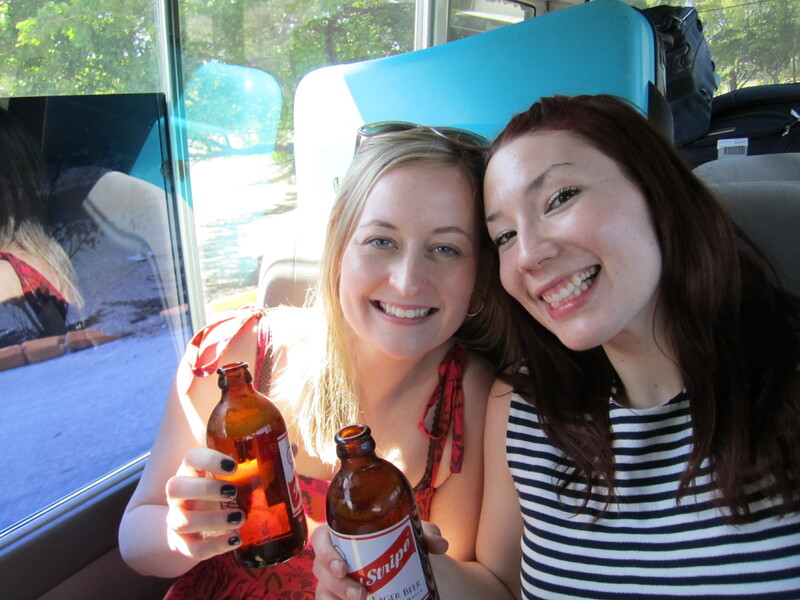 red stripe on the bus! So, once Kate and I got into our room we put on our bathing suits and headed to the beach to get our tan on … with a little stop at the reggae cafe for some jerk chicken first. One of the waiters (our favourite…obviously) started chatting with us and told us that it was tourist night at Margaritaville in Ocho Rios and the resort had a bus that would take us there and back. We were feeling pretty happy (also known as a little something we like to call afternoon drunk) by the time evening rolled around so we put on our dresses and Jamaican dancing shoes (also known as flip flops) and hopped on the bus to Margaritaville …. WARNING – MOM, YOU MIGHT WANT TO SKIP TO THE NEXT PARAGRAPH … we were having such a good time dancing away that we actually missed that bus home! (I swear, no one even looked for us!! lol) Luckily, a bellboy who worked at the resort that we ran into at the bar offered us a ride home … so we hopped in his friends car and made it back to the resort safe and sound. Here is where I will tell you (and you will still worry, I’m sure), but Jamaicans are the friendliest, nicest and most helpful people I have EVER met in my life. It is rare for us to walk down the street and not have at least a handful of people pull over to ask us if we need help, a ride, directions, or just to say hello and chat with us. It is a huge part of why I love this culture! So, needless to say after our awesome night out in Ochi, we were no longer satisfied simply staying on the resort and laying on the beach …. we wanted to experience Jamaica! 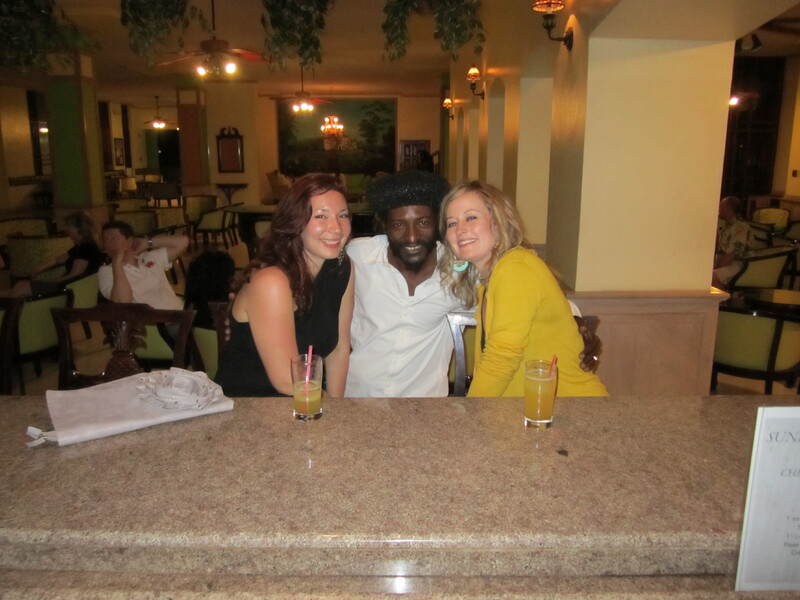 On our second day, we met Buffalo Bill Reeves – who is another huge reason we fell in love with Jamaica. Not only will Billy always be our favourite rasta man, just for who he is and his amazing singing talent, but for what he showed us – the real Jamaica. He took us to only a couple of places but they were non-tourist … the blue hole, Fern Gully (to be honest … I thought Fern Gully was just a movie Kate and I watched a ton of times when we were kids ..), a fisherman’s village, and through a town that I now cannot remember the name. With that being said I think it’s safe to say that Kayla and I were hooked. Days passed like minutes and before we knew it we were back on that same bus that opened our eyes heading back to where we were originally running from! Most people I talk to after having gone on vacation (clients being the only people I spoke to at the time as I worked insane hours and had no life…) say that it was amazing, but at the end of it, they were ready to go home. I have never left Jamaica “ready to go home”. I have left other vacations with that feeling, but not Jamaica. I felt like I was already at home and being forced back into a world I no longer wanted to be a part of. Dramatic? Yeah, maybe a bit, but seriously, my heart breaks every time I board that plane and watch Jamaica disappear. THIS is why after every trip, we have almost immediately booked another one. Jamaica is like a high, and you lose it every time you set foot in the country you grew up calling “home”. Yes, there are tiny fixes…phone calls, listening to dancehall, looking at pictures (obsessively sometimes), the time I found Ting at loblaws, ordering a Redstripe anywhere they serve it…but there is nothing like the real ting…uh..thing. Anyone that knows us can tell you that we were never the same after that first trip. Probably because the main topic of conversation when around Kate and Kayla was about Jamaica…. (seriously, my sisters created a drinking game that every time they heard “Jamaica” they would take a drink…they are now in rehab…haha kidding..but they really did it at parties! )..but there was this feeling we both had that we couldn’t shake. Like there was more to life that I didn’t know before. More to life than just working. I didn’t want to work just for money to buy things that would fill a house I would eventually buy. I wanted to see the world. And by the world, I really mean Jamaica. Awww I loved reading this! Only one post?? You girls need to get on it LOL. Reading that just reminded me of when I was you so many years ago. Now I’m anxious to read more about your move…I’m sick of hearing my own story of moving there LOL. So happy to see that you are following your dream. I am anxious to see you both next week. P.S. I did not skip the paragraph. I am confident that you would not take risks that would put you in harms way. It sure sounds like you found your paradise. Congratulations on making such a brave move. I am sure you are having the time of your lives. Be safe. It is great to feel so alive. Easy to do with the stimulation of a decided change of life venue. There are life changing experiences around the corner where we live. All that said. It does sound great. Well, girls…I totally enjoyed reading about the beginning of your new journey…the way I see, you only have one life to live…so live it up in style..Jamaican style…awesome…that was the crazy in me , now the auntie in me is coming out saying…just be safe girls….follow your gutt…you can never go wrong this way..and I to loved my trip to Jamaica…p.s. have some jerk chicken for me! love ya Katie xoxoxo see you in March! Thanks for taking the time to check us out and spreading the word about us! I just finished reading and I am in complete awe of how your last paragraph perfectly describes my experience. It’s like you took the words out of my head! I felt like I was home and cried when I had to leave. I am now preparing to move there myself and hopefully attend UWI in MoBay. I have a 3 week trip planned in January and moving in April or May. I can’t wait!